Climate is a fun one to tackle because its the result of the confluence of all of the topics we spoke of earlier. Moist winds bringing condensation from warm waters that dump oodles of water on the windward side of mountains creating streams and lakes that feed plants and animals. Its a cycle that takes a lot of cogs to work correctly, and putting that into an imaginary world is a lot of work, but very much worth it. Lets start with a look at a pretty basic Climate Map of the earth. You’ll quickly notice that there are several categories, each with subcategories. 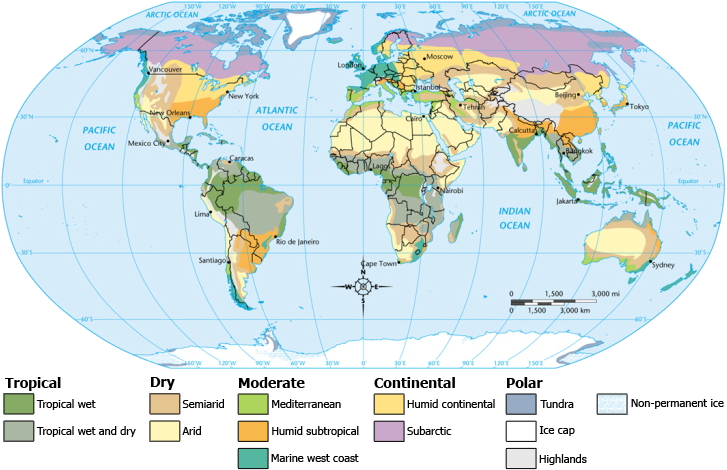 Tropical, Dry, Moderate, Continental and Polar give us the broad categories, and while there is a massive amount of detail to it, we can generally go with a base assumption that each is a combination of two factors: Heat and Precipitation. The subcategories change a bit in the exact description and type, and they are pretty easy to look at and see whats going on. Lets take even a further look at what is happening. One of the large differences is that as a player in the united states, I have almost no chance of understanding what it is like in Europe. Well, except me and a few others along the central east coast. There is that little band of Marine West Coast in there. That complicates what we are trying to do in interesting ways. The fantasy worlds we often try to create are based, mostly, on the Feudal and Medieval systems created after the fall of Rome and during the so called Dark Ages. These systems, as almost all human systems, are part of the environment that they are created within. Europe has an interesting geography in that almost all of it is warm and wet, where as the vast majority of the US is cold and mild. This skews the perspectives we have when creating vegetation, and especially in how the seasons work. Make sure to take that into account when thinking about the climates your creating in your wold. Often you know little or less about what your creating, and a bit of reading as your creating them can be a great boon. You should notice, too, off the bat, that peninsula like areas are generally wet on one side, and dry on the other, almost always ranged by mountains. Italy and southern Spain were clearly cut off from the rest of Europe by the Alps and the Central System, respectively. Additionally, you can see that wet tends to extend until a mountain range catches it and dumps its water out. Indonesia, Africa, and South America, all show this trend. Winds are bringing rain across the continent. North America and Asia both have an opposite system, where the prevailing winds are coming from the West and have little chance to drop on most of the country, creating an area of lower than expected rainfall. The big thing for me, though, was that aside from South America, the central portion of four of the five landmasses generally suffer less precipitation than the coasts and the south. The United States has a huge Dry and Continental segment straight in the middle, and almost the entirety of Canada and Russia are subarctic. Even Africa has a large portion of desert in its largest, widest segment. This, here, is the tricky part. Surprise, right? Everything has been easy until now. Taking into prevailing winds and ocean currents – Cold air tends not to aid evaporation, dry air tend to aid in evaporation. Hot dry air blowing over the warm waters tend to create large storms due to condensation it engenders. Rain tends to fall consistently until it hits a boundary that forces air up and over it, but the heavier H2O has to condense and fall out of the sky. The closer to the poles you get, the colder it gets, the closer to the equator you get, the warmer you are. Rainwater leads to streams and ponds, which leads to more water, which leads to more rain, which continues to cycle into more water, and so forth. Those are the basics, the simple parts. The stuff we can see. Now, We have to look at the areas of the world we’ve invented and try to imagine how the world around it that exists, but we don’t know about yet- we haven’t made it – interacts with the water and the air. Lets look at the map I have. Here we have a few things going that are going to try and dictate our climate to us. We are sitting above the Doldrums 15 degree bands around air current bounds, so we will have a good windflow. The wind is coming up from the Equator, for the most part, so it will likely be humid already, and will be cooling off as it blows across the cool water below it, creating clouds and rain all along the western and southern coast. the eastern southern coast, though, will be a bit warmer and more wet, even, than the west, because the warm water current is going to be split by the peninsula, sending warm water around the bays and then back down to the equator when it meets the cool stream south of the big Island. Conversely, that means that the cooler water in the north will have little effect as the winds blow up and across the landform, generally, blowing the storms of the inland across into the ocean. To me, this cuts the landmass into 6 distinct climate regions. Each of these denotes a certain type of environment and a certain type of animal and plant that lives there. We’ll look a bit more into the Flora and fauna later on. What is awesome about a fantasy world, though, is that these don’t need to be exact. Instead, you can create some excellent and world consistent reasons why the world doesn’t work like you would expect. You also are armed with a great knowledge of how this would change, given your fantastic additions. Is there an ever burning forest? Is it situated in an arid or a wet climate? How does it have fuel/how does it survive rain? is the heat strong enough to act as an artificial mountain, sending the condensation and precipitation further into the air? Is there an enormous inland glacier sucking up the hot air and pulling it in like a vortex, creating massive clouds around the area as they all converge and convene? There are so many interesting details you can put into a land once it exists according to some real world logic and you’re able to manipulate it correctly so that the transitions feel good, fun and fresh. Right now, though, I think we’ve got a great picture of what we have for the landform, and maybe a direction we want to go with putting some civilizations, plants, animals and other details in. With all of the landforms, Currents and General High Level concepts out of the way, its time to get into the deeper details here soon!